Keeping the house under constant surveillance has become an utmost necessity in many households. In order to prevent thefts or monitoring the actions of your infants as well as pets, wireless security cameras do a great job. Capturing every single detail even during night time, these cameras also offer wide angle views. Be it any industry, traffic signal, your house or any public place, security cameras have become important these days. Security cameras help you to monitor every movement and keep yourself secured from any unauthorised activity. However, if you are using a wired security camera then it can create a lot of problems for you. The wires can get damaged which can cause the loss of connectivity. Plus, the wires can get tangled which can cause further problems. 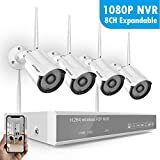 With the best wireless security cameras for home or office, you will be able to check everything and remain secured without worrying about wires. Want to know which one you need to choose? Know more about these products with the help of our list. 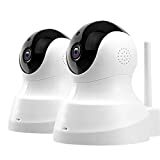 Zmodo wireless security camera kits for indoors or outdoor are very capable and have few who can rival them in the market. They are feature packed and the perfect tool to address your security concerns for both yourself as well as your loved ones. It’s a high definition camera that would have its abilities cut off during the dark. Also, it is easy to set up and you won’t have to face any difficulties in installation. Even if you are not a technical guru you can use this and operate it effortlessly. Being waterproof and having 24 automatic cameras, it functions excellently well even in a temperature range of -10-degrees C to 50-degrees C. Just adjust the infrared sensitivity and you can view crystal clear images even during night time. 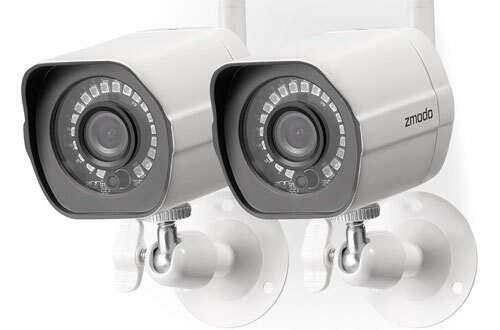 Plus, the cameras get easily linked with Zmodo Cloud servers which have high-end encryption and their footage can only be viewed from your Zmodo account. Compatible with most common 2.4 GHz wifi band. Uses secure and safe AES 256-bit encryption. 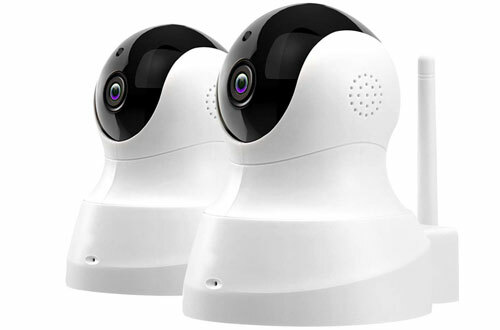 Setting up Arlo wireless security camera system for home is always fast and easy. 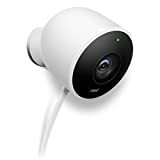 Firstly, the cameras have a wide viewing angle of 130-degrees and proper positioning allows you to reap the most benefits of your Arlo system. Secondly, it has motion detection capabilities to alert you whenever there is unwanted movement. Even it is versatile enough to let you adjust the motion sensitivity too. Use the Arlo app to test the motion sensing capabilities and optimise according to your needs. 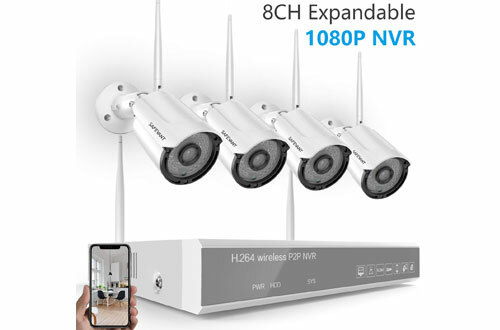 Also, if your WiFi connection covers your whole residence, your Arlo wireless cameras can be virtually placed anywhere you want. With live access to footage and two-way audio system, the easy installation makes it all better. Moreover, it has a smart siren that crosses 100 decibels when it wants to alert you and the neighbours of suspicious individuals. Resistant to elements of weather and hence perfect for monitoring outdoors and indoors. Doesn’t require even a power cord and truly wireless. Batteries get charged very quickly. It is a really reliable brand and known for their high-advanced security products. 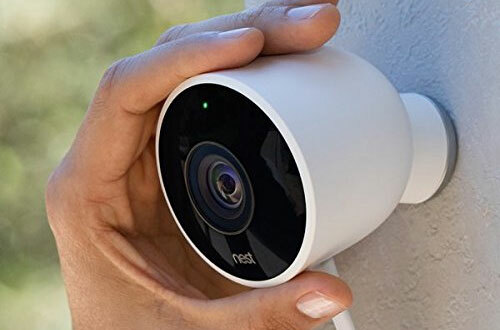 The Nest outdoor wireless security camera lives up to the brand’s reputation. Its best feature is the 24/7 live streaming that allows you to keep a close watch from wherever and whenever you want. Besides, it even has 2-way audio so it doesn’t just record audio but you can speak to anyone on the other end. Further, it is made of extremely good quality materials and comes with a very long waterproof connector. With a cloud storage option and a crystal clear viewing experience in 1080p, one can also get instant alerts right on their phone with Nest Aware. Can withstand most elements of nature. You can get videos from the cloud that is up to 30 days old. Now, work at your office, go for a jog or on a date without having to worry how your family or pet is doing at home. 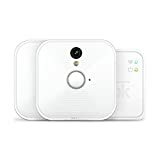 The Blink indoor wireless security system with WiFi will solve all of your problems at an unbelievably affordable rate. 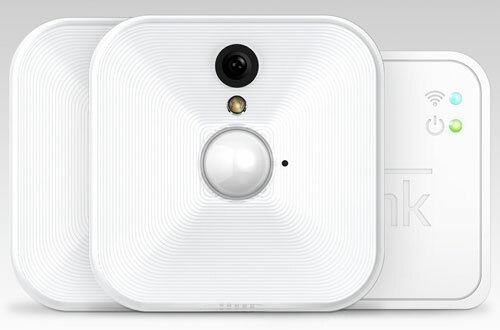 Apart from having inbuilt motion sensor alarm, it even has motion sensing capabilities. So you get alerted when the delivery guy delivers a package or an uninvited “guest” is trying something funny. Furthermore, unlike other brands access to Blink’s cloud storage services comes free. In fact, it assures a self-installing procedure and the Live Stream helps to keep an always. Powered by a battery without the complication of wires. Access your cam footage anytime from the Blink app on your smartphone. 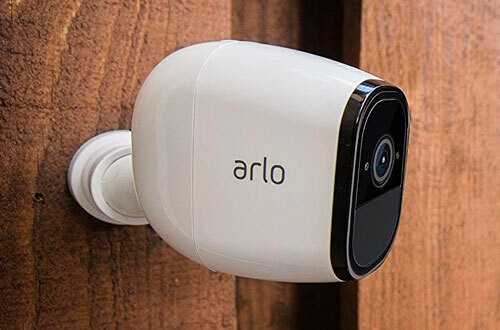 Arlo has established itself in a solid position in home security. With their new Arlo Smart, you won’t be bombarded by the endless notifications that plague your notification panel. Arlo Smart now allows you to filter out motion detection by type. So you can choose person detection which would lead to less irrelevant notifications. And it allows keeping the material recorded for future reference. You can also draw up and select the area within the camera’s view you care about. The Arlo Smart checks if something has entered that zone before it gets triggered and sends a notification to you. 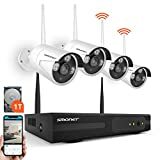 From being a night vision camera to having the motion detection capacities, it is also a wireless device with a range of 300+ feet line of sight. Finally, view in complete 720p that makes everything much clearer. Cameras are compact for discreet placement. Batteries last for 4 to 6 months easily. The system is expandable with more cameras. 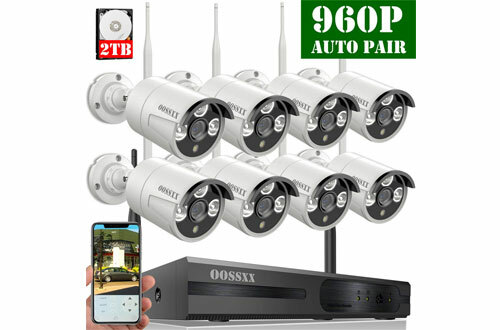 After you leave home, be worry free since you have the capability to watch over your family and quickly take action with the Oossxx wireless security camera system with night vision. Other than constant vigilance, you can even scroll back your videos. So you won’t miss precious moments like your baby’s first step or their first words. Even during dark rainy nights, you will have clear picture quality with their HD night vision cameras. And the IR cut filter even comes with an auto-switch function. Plus, having a metal bullet construction, it has a 70-degrees viewing angle as well as motion detection alert. The system can be expanded too since it can support up to 8 cameras. So even if you have a big home all the areas that demand your concern can be covered. It supports both wireless WiFi connection and wired connection. Has an IP66 rating so wind, rain and dust have negligible chances of causing damage. Offer night vision range of maximum up to 60 feet. While most companies are providing cameras that offer only 720p resolution, YI is offering you full HD 1080p recording. That means sharper, clearer and image quality with lesser distortions. Plus, it has a wide field of view covering 112-degrees and offers you controls like never before. 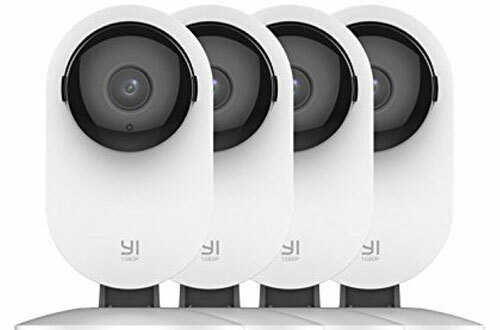 You can control these cameras from your smartphone with YI’s app. If you want finer details and a bit of zoom just double tap on the screen and pan your smartphone to get a panoramic view. Furthermore, you won’t miss out on any important footage even if your camera gets damaged. For added convenience, one can access all your recorded footage from YI’s cloud servers that have superior encryption. SD cards, as well as hard disks, can be very unreliable and get easily corrupted. So, YI is offering a one month trial period on their cloud storage and encouraging you to move on to a better platform. Has a baby crying detection. Night vision with powerful as many as 8 940nm infrared LEDs. Supports Micro SD cards up to 32 GB for local storage. SAFEVANT is offering an amazing deal that is too good to walk away from. 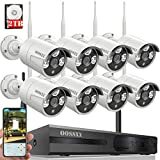 You get 4 high-quality security cameras that make your house highly-protected. Also, it can record videos at 1080p and supports 8 channel recording. For keeping the user informed, one will be alerted via email, sound or other methods at the trace of any suspicious activity. Furthermore, it is waterproof, enables night vision; the system also provides remote access. Motion sensing to your rules and if you want, even video loss can trigger the alarm. Supports Android, iOS and Windows. Tenvis has brought to you a product that even supports micro SD cards of 128 GB capacity. Thus, you can record constantly for up to 60 days before replacement or erasing is required. It is a motion activated a real-time camera that has a promising viewing quality of 1280*720. Plus, the instant alerts will help to receive timely notifications. And the two-way audio system makes communication easy. In fact, a night vision range of 32 ft will keep thieves as well as other trespassers away. However, the ‘Sound Wave Smart Connection’ is pretty exclusive that aids in the faster installation process. Works on WiFi band of 2.4 GHz. Has a horizontal rotation of 340-degrees and vertically can rotate up to 105-degrees. Motion detection very useful against invasion or theft. Long wires running through your walls and the huge installation cost is always a nightmare when it comes to security cameras. But with the Smonet security system, you won’t face such problems. As one just needs to connect to a power outlet. Thus, the footage is transmitted via connection with the NVR. You can even eliminate the need of power cords by using batteries to make it truly wireless. The system even allows you to watch live video and access pre-recorded footage without the need of any internet. Plus, the use the natural pinching gesture you use on your smartphone to digitally zoom the images. A wide range of operating system support. Night vision range of up to 65-feet and powerful IR is also included. 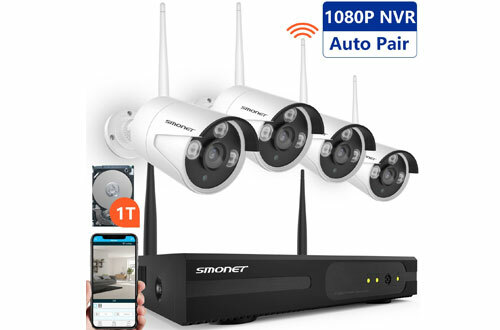 To have full surveillance, installing a wireless security camera and recorder is the best choice.